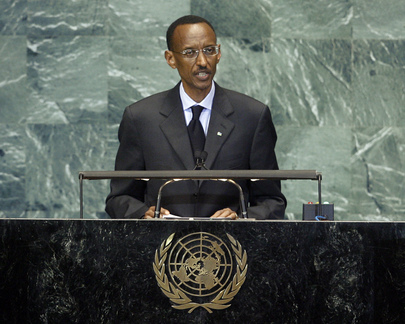 PAUL KAGAME, President of Rwanda said it was right that the current session of the Assembly was re-examining the role of the Organization in global governance. The just-concluded summit to review the status of the Millennium Development Goals had provided another opportunity to assess the work of the United Nations, which, he said, was uniquely placed to play a crucial role in mobilizing and galvanizing all nations for the common good, driving forward collective initiatives and coordinating actions that fostered social and economic development of all. The United Nations was the sum total of its Member States and could only be as good as those constituent Members wanted it to be. If there was common understanding among the membership, the Organization would deliver more efficiently on its mandate. However, it had evolved into a two-tier Organization, reflecting a world that seemed to be divided into two major categories - one with inherent laudable values, rights and liberties and another that needed to be coached on those values. Rwanda and many other developing countries seemed to have been relegated to that latter category. Marginalized and disenfranchised, he said: “We are also considered chronic violators of our own human rights.” The implication was that the United Nations held a certain standard for some countries and another for others, especially on international issues. In his view, a debate on the two categories needed to take place among the membership so the Organization could “regain the noble ideals of its founding”. Rwanda subscribed to the principle that every State was accountable to laws and that the rule of law should govern everyone, but all international rules and laws needed to be equally enforced. When there were no avenues to appeal international rulings, when there was an accountability deficit in key global institutions and when ordinary citizens felt that the United Nations could not deal adequately with issues affecting their daily lives, the Organization could not be seen as credible, relevant and democratic. “We should make sure that this Organization does not become a tool for the powerful to protect their interests and enhance their influence, or to use it in subjugating others,” he said, adding that his country would continue to believe in multilateralism. Touching on other issues, he said that as his country rebuilt, there was an acute awareness of the need for lasting peace and security. Rwanda would continue to work in partnership with its neighbours, international and regional organizations and the African Union to ensure that peace and security prevail.